This photograph shows landforms on Coraholmen Island in Ekmanfjorden, one of the fjords found in the Norwegian archipelago, Svalbard. These geomorphic features were formed by Sefströmbreen, a tidewater glacier, when it surged in the 1880s. Although all glaciers flow, some glaciers undergo cyclic changes in their flow. This is called surging, and glaciers that surge are called surging glaciers. During their active phase, surging glaciers speed up and advance. At this time, glaciers collect, transport and deposit large volumes of sediment. This active phase is then followed by a so-called quiescent phase, when glaciers slowdown and retreat. Sediment carried within the ice is then exposed. Often surge-type glaciers produce a characteristic set of landforms, like the red ridges featured here in this photograph. Only a small proportion of the world’s glaciers surge. Svalbard is home to many of these surging glaciers, and the length of the surge cycle varies by region. A quiescent phase of surging glaciers in Svalbard can last between 10 and 100 years. An active phase is commonly between 1 and 10 years. Surging glaciers are enigmatic; we still do not fully understand all the processes that cause these glaciers to switch between active and quiescent phases. When Sefströmbreen surged, it advanced over the fjord and overrode Coraholmen Island. The glacier deposited up to 0.2 km3 of sediment on the western side of the island. As a result, the island doubled in size. The red ridges in the foreground of the photograph were formed when sediment under the glacier was squeezed up into crevasses, large cracks in the ice. Once the ice melted, these crevasse-squeezed ridges were exposed. They contrast in colour with grey Kolosseum Mountain in the background. Glaciers are useful indicators of past climate and they are used for climate reconstructions. However, surging glaciers are not suitable for such reconstructions. This is because glacier surging is not directly related to climate. When a surging glacier advances during its active phase, it does not mean that the climate is colder. This also holds true for the past. If a surging glacier was bigger at some point in the past, it is not because the climate at the time was colder. If we didn’t know that the glacier surged, we would make a wrong inference about climate. Therefore it is important to know which glaciers are surging-type glaciers. To document surging behaviour of glaciers, we can use historical sources, glaciological observations and satellite images. If no such records exist or if we are interested in time period that precedes satellite observations, we rely on landforms to tell us the story. We can study these landforms, their appearance, shape, structure, and what they’re made of to learn about past behaviour of glaciers, their dynamics, and processes that go on underneath a glacier where it meets its bed. 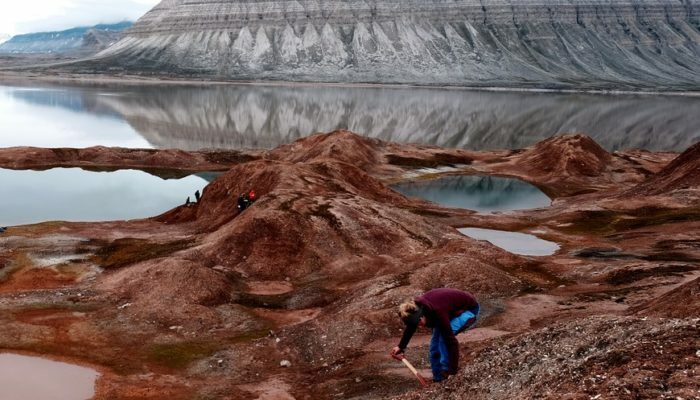 The photograph was taken during a field cruise as part of the University Centre in Svalbard’s Arctic Glaciers and Landscapes course. Imaggeo on Mondays: An ancient landscape and the never setting sun.